Dining area looking towards the kitchen. 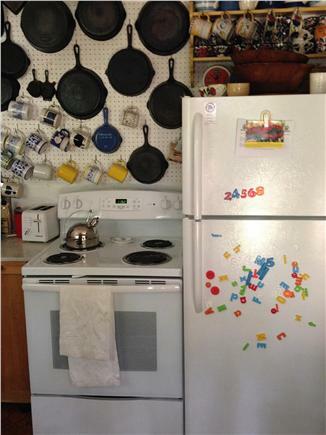 New stove and fridge in the kitchen. Plenty of cast iron. Longnook Beach at low tide. Ocean view over the treetops from our deck. 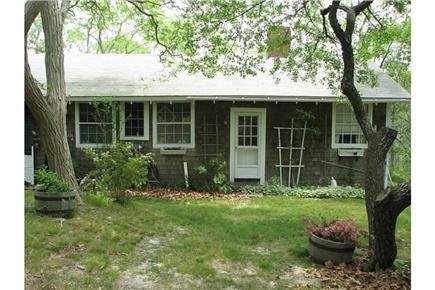 This classic Cape Cod cottage with ocean views sits on 1.5 wooded acres and is walking distance to Truro’s famous dune beach, Longnook. It’s the perfect place to unplug and get back to nature. The pictures do not do the property justice. 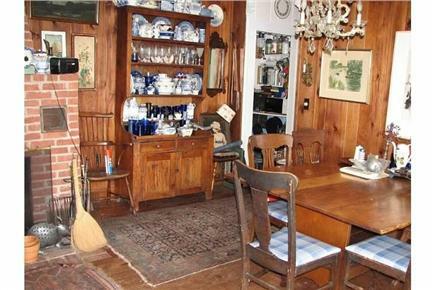 There is a large combined living room/dining room and a reasonably appointed kitchen. Vacationers have three rooms for sleeping: a large master bedroom with a queen bed and an attached half-bath; a second bedroom with twin beds; and a third with a queen bed. There is both an indoor and simple outdoor shower, and there’s a working fireplace in case the weather should turn chilly. 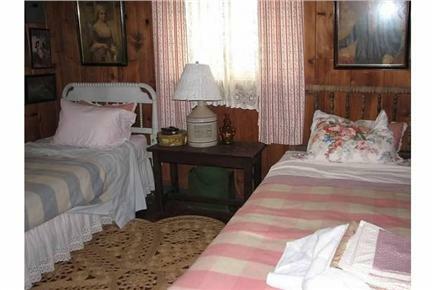 Please note that the home is clean and fully functional but is quite rustic. It has a lot of small antiques and tchotchkes all around. 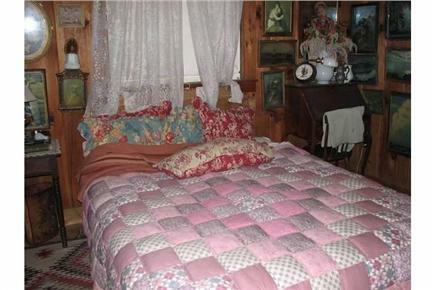 The floors are well worn, and the furniture and appliances are older. It’s best for a single family, couples, or small group of friends, and not suited for children under age 10. 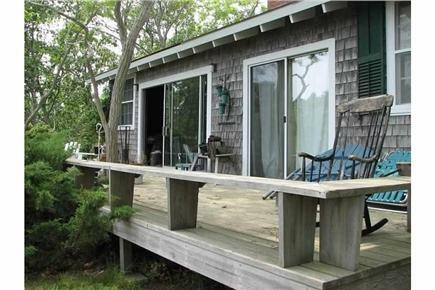 The wide porch is great for morning coffee or sunbathing, while the surrounding woods make for a private getaway. Beaches on the ocean and bay side offer plenty of options. There’s no Wi-Fi at the house, but that’s available at the local library (and a few local businesses). At the current time, we have no laundry facility on site either. Additional availability info: No Oct rentals. This is a summer home with no heat. Off-season is Sept. This is a Saturday to Saturday vacation rental. Additional pricing info: We ask $500 upfront refundable deposit. New weekly pricing includes taxes and $165 for cleaning. State and local taxes of 12.45% will apply. This is summer living - lots of cross breeze, a good grill, plenty of places to read a book or gather the family for fun. For us, this was the perfect place: homey, comfortable, interesting. A great place to launch a walk or a bike ride. Easy stroll to the beach. We all loved the outdoor shower and the deck, where you could be in the sun or the shade all day long with just a shift of your chair. Fabulous sunrises over our section of water view. Second year even better than the first! I am a Yankee dispatched for personal reasons for Texas. I spend as much time as I can on the Cape, grew up spending summers in this very house, and am happy to share it with visitors -- whether they are first-timers or old-timers. We get back each summer, but August is a time for my wife and child to deal with school matters, so that leaves us with a house for you. 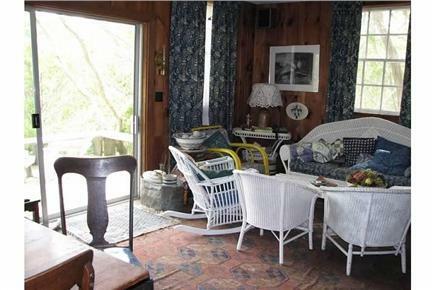 The house which sits on a quiet wooded hill top overlooking the waters of the Atlantic -- keep your eyes peeled for whales breaching in the distance -- belonged to my late mother, a wonderful artist and intrepid fan of flea markets worldwide. Now the house belongs to my brother and I, and we like to make it clear that this is no ordinary cottage. Built 60 years ago, it contains not just a lot of family history but also a fair amount of my mother's inventory of mid-century collectibles. We are undergoing some routine maintenance these days to improve the condition of this old home, but as they say in the real-estate game it's all about LOCATION LOCATION LOCATION and we have that in spades. Longnook Beach is one of the most spectacular not just on Cape Cod but in the world, and we have easy access -- a 15-minute walk down a long driveway gets you to the top of the famous Truro dunes and the sandy shores of the Atlantic. 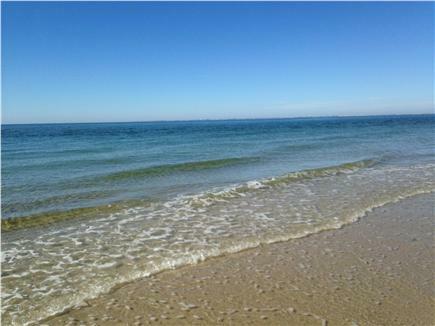 A five minute drive gets you to the lovely, swimmable family-friendly beaches of Cape Cod Bay. Trust me, whatever your taste, the surroundings are just paradise. The house is a few minutes drive from Truro's small town center which has summer concerts near the quiet Pamet River. The town boasts a Post Office, the local Mac's Seafood shop, and grocery and sundries at Jam's. However, there is no shortage of access to more active communities, as both historic Wellfleet and happening Provincetown (very LGBT friendly) are a buzz during the summer with theater and cabaret, concerts, seasonal and year-round restaurants highlighting the community's farming heritage. Really, it's the beach that keeps us entertained about 90 percent of the time, but such amenities are within easy reach.